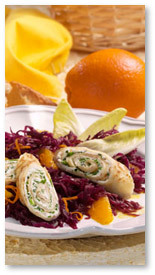 A vibrant vegetarian salad with healthy and nutritious ingredients, including red cabbage, oranges, and sunflower oil, accompanied by a herb-cheese filled roulade. A delectable quiche made with mild wine sauerkraut and ham on a crunchy home-made pizza crust. Baked potatoes topped by brown-golden sauerkraut and gouda cheese, mixed in light creme fraiche. A truly yummy evening entree or special side dish.